I finally decided to quilt this top that has been sitting around for the last, oh, 4.5 years! 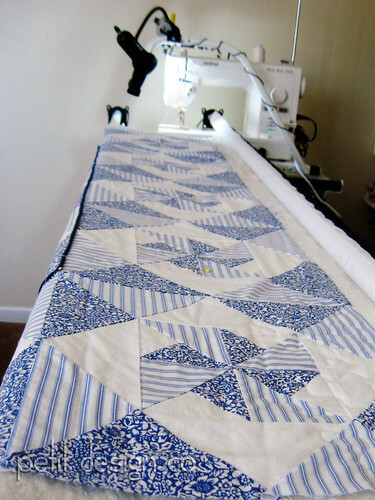 This was the very first quilt top that I decided to tackle way back at the beginning of my quilting career. Back when I was too naive to know I knew nothing about quilting! I knew absolutely nothing about bias, seam allowance, sewing a consistent 1/4" seam, pressing, or even cutting. Back when all I had was a $50 Kenmore sewing machine that would take off at the slightest tap of the pedal. Well it sat in a "completed sate" for a while because I didn't feel confident enough to quilt it myself. Then it sat some more because I soon realized all of the many mistakes that this quilt top showcased. A couple of months ago I pulled it out and repaired it. Yes, I had to make repairs! There were some seams that in places had no seam allowance. Talk about embarrassing! This quilt top is of course completely wonky and not square because most of pieces have some bias involved. Oh, and I have no idea what I was thinking with the piping on this quilt. I won't even point out that I didn't even know how to attach piping properly. While I would love to just trash this top, I can't. This is my husband's quilt. When he was 19 he served a two year church mission to Nagoya Japan. The fabrics in this quilt are from the Japanese futon sheets he used while on his mission. I know that he will love it with all of it's wonderful imperfections. Ok, back to quilting. Hopefully all f the imperfections won't drive me bonkers while I'm quilting. Luckily all of us quilters know that it will all quilt out right? :) ha! I'd love to hear all about the perfectness of your first quilt top! I love your quilt. The fabric is just lovely. I hope to have a story like yours one day. I still have not completed my first quilt because I am to chicken to quilt it. Maybe one day I will work up the nerve. Take care. Do you mind me asking what quilt frame you are using? It appears you are using a DSM? Awwww, Norma...I'm sure Mr. PD will love it! I love the colors - so crisp and clean...my bedroom set is the same combination - such a soothing combo. Add that to the amount of memories attached and I'm sure it will be a winner! It will come out just fine and be much loved for years to come. This will always be a special quilt to you, my first quilt was 5 inch cordory squares, a blanket in the middle and a sheet on the back. I just tied it but my brother still has it after 40 years. Good luck!